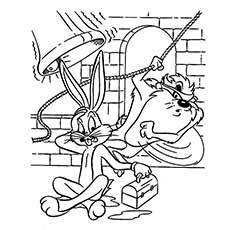 Looney Tunes is an American cartoon series produced during the golden age of American animation. The series originally displayed the musical compositions through the adventures of the cartoon characters. It was then made into a short film and later in a television series. 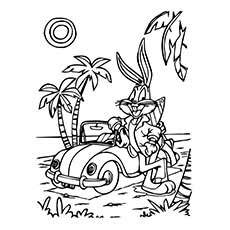 If your child loves the character, or if you did and would love to introduce your child to it, these free Looney Tunes coloring pages to print that are a great way to do so! 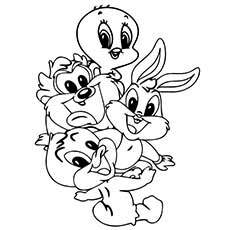 Looney Tunes cartoon features popular characters like Bugs Bunny, Porky Pig, Tweety, Sylvester, The Road Runner and many more. 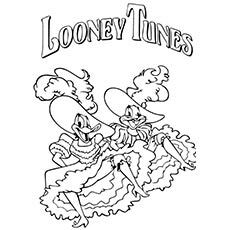 The characters together are referred to as the “Looney Tunes”. 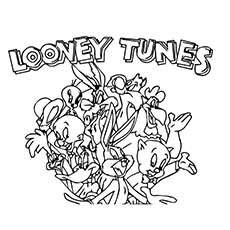 Here are 10 printable Looney Tunes coloring pages featuring the most popular characters from the “Looney Tunes” show. 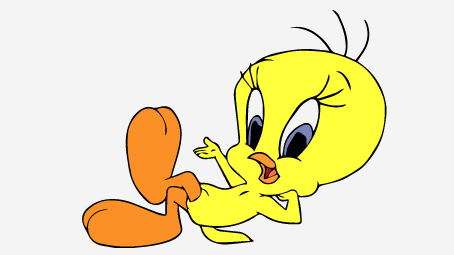 Tweety is a yellow canary that appears to be innocent and vulnerable, but beneath his delicate yellow exterior lies a crafty heart. He is an aggressive character who does everything to foil his enemy. This clever little bird can easily outsmart Sylvester the cat, who spends most of the time trying to catch him. 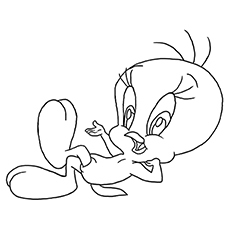 The long lashes and high-pitched voice of Tweety may suggest that the bird is a female, but it is male. 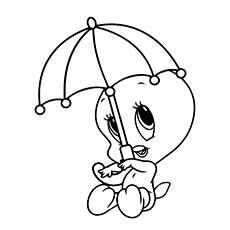 The shape suggests that Tweety is a baby bird. Here is an adorable picture of this cute, yet cunning bird. Sylvestre is a black and white cat who is mainly seen chasing Tweety and Hippety Hopper. This hungry pussycat prefers eating birds to regular cat food. He is extremely proud of himself and never gives up, even after failing miserably several times. His trademark is his sloppy yet stridulating lisp. 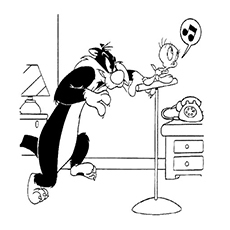 The picture shows another unsuccessful attempt of Sylvestre in catching Tweety. 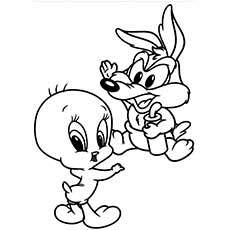 Road Runner and Wile E Coyote are the duo cartoon characters in the Looney Tunes. The unending appetite of Wile E Coyote drives him to catch Road Runner. Wile is even willing to risk his life to catch Road Runner, but is always defeated by the bird. Instead of utilizing his animal senses, he relies on absurd gizmos, which gives Road Runner an upper hand. Here is a funny image of Wile E Coyote trying to catch Road Runner. Emma Webster, better known as Granny, is a kind and good-natured old lady with a cheerful and spunky personality. She lives across the street with her pets Tweety, Hector the dog and Sylvester. Granny is overprotective of her beloved canary, Tweety. She protects her from Sylvester, who always finds a way to break into the granny’s house, looking for a meal. Granny is an old fashion lady, depicted wearing schoolteacher dress, spectacles and a gray bun. Paint her in some vibrant colors instead of the regular white and gray. 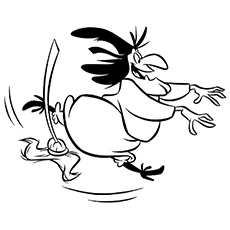 Witch Hazel is a no-nonsense witch, who lures children into her house to eat them. 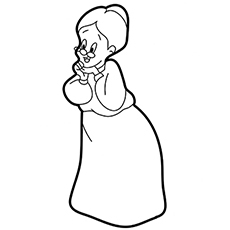 Besides being a witch, Hazel is also Bugs and Daffy’s neighbor. She is a loving mother of a giant hairy monster named Gossamer. Witch hazel is a green-skinned witch, dressed in plain blue cloth and a crumpled long black hat. She has unruly black hair, which zooms off on her broom. She has twig-like legs, a single tooth in the mouth, nose, and chin jutting bulbously from the face. 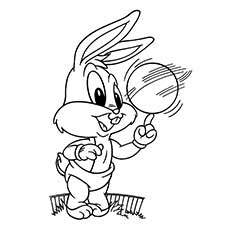 Bugs Bunny is a gray hare, renowned for his relaxed and confident personality. He is passive, cunning, charismatic, cool and several steps ahead of others. This smart bunny is capable of outsmarting anyone who antagonizes him. 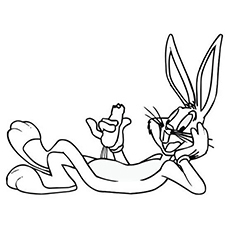 Bugs Bunny is known for his popular catchphrase “Eh, what’s up, doc?” which he says while greeting anyone he encounters. 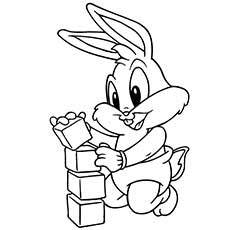 Like other bunnies, Bugs Bunny also loves eating carrots. He loves them so much that he carries at least one with him wherever he goes. 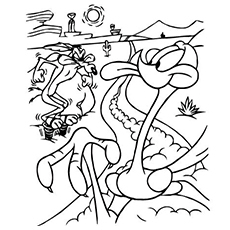 This is a coloring sheet of Bugs eating his favorite food- carrot. 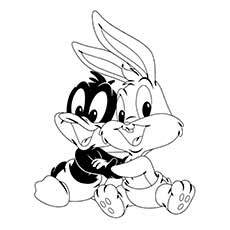 Daffy Duck is usually projected as a rival or best friend of Bugs Bunny in the cartoon series. He is narcissistic, delusion and even petty. He thinks of himself to be better than everyone else around him. He holds long grudges over smallest incidents. 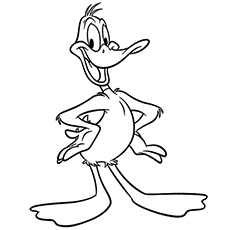 Daffy resembles a lot like a normal duck with short stubby legs and a beak. The outrageous behavior and extreme personality of Daffy Duck have made him a favorite of most of the kids. They will surely enjoy coloring this short-legged duck. 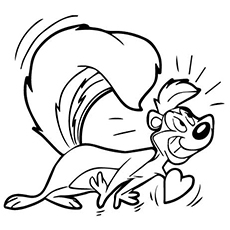 Pepe is a stereotypical French skunk with a refined sense of taste that makes him irresistible to women. Pepe is continuously in search of love and romance, but is inhibited because of self-delusional and overly persistent manner. Pepe Lew Pew will make a stunning poster in your kid’s room. 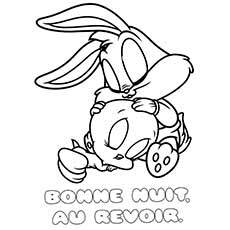 Use this coloring sheet and paste it on the wall. 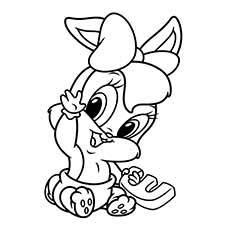 Porky Pig is a wide-eyed pig in the Looney Tunes cartoon series. He is very innocent, which makes him an easy target. 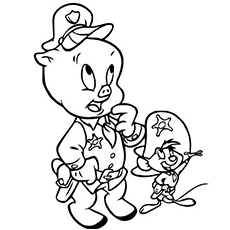 Porky’s distinctive trait is stuttering, which he compensates by replacing the words. Fill in this drawing sheet with any colors of your choice. 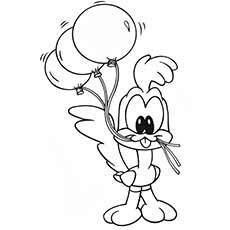 Gossamer, also known as Rudolph is the shy and nerdy son of Witch Hazel. He is an 8 foot, hairy and red monster. 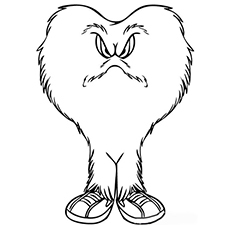 In fact, Gossamer is composed entirely of hair. He is a small kid who behaves nicely with everyone around him. 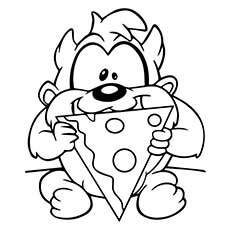 Gossamer has a rectangular shaped body perched on two giant tennis shoes. His face is composed of two oval shaped eyes and a wide mouth. Fill in some color to make him appear a bit more lovable. 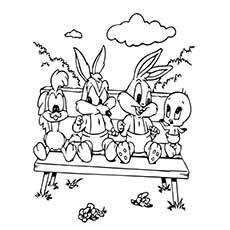 We hope your kids will enjoy painting the Looney Tunes coloring pages printable free. Do not forget to share your experience in the comments box.